By taking part in the IMPACT! Training program, Madeleine was able to find resources available to help kick start her project. As start-up costs are high for beginning farmers, funding was needed to help cover some of the initial costs. In April of this year, Madeleine was awarded a grant from the JustChange foundation! JustChange is a group of individuals who put our money where our mouths are by pooling funds to support great ideas. A few of Madeline’s responses to JustChange’s questions about her project are included below. 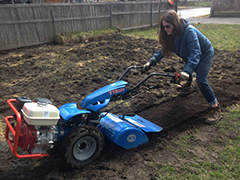 This grant helped with the purchasing of necessary equipment needed for starting up the growing season. 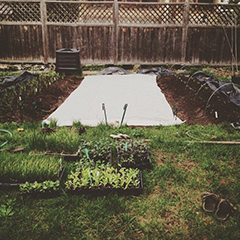 As the temperatures begin to warm, Britannia Backyard Edibles is in full force prepping garden beds which will soon be planted with thousands of tiny seeds. This season Madeleine will be providing CSA shares to 10 families in the community. 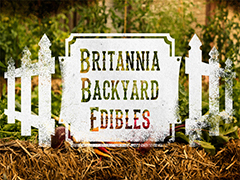 To learn more about Britannia Backyard Edibles and follow along as the growing season progresses please check out our facebook and twitter pages. JustChange: What problem are you trying to solve? JustChange: How are you going to solve the problem? Madeline: "Britannia Backyard Edibles grows and supplies fresh, locally and organically grown market vegetables through Community Supported Agriculture and other direct to consumer markets. The business operates in a sustainable manner using low carbon farming practices to provide a food source within the community for the community." JustChange: How is your idea innovative? JustChange: How will your initiative make a lasting difference (social or environmental) in Ottawa? JustChange: What makes you and/or your team the people to lead this idea? JustChange: What are your funding/financing sources? To learn more about the IMPACT! Sustainability Champions Training and to apply for an upcoming session, please visit naturalstep.ca/impact. The next session is happening in London, from November 6th to 8th. Apply today to take your sustainability journey to the next level!